And then, like many of David’s psalms, it moves quickly to a second set of couplets that deal with David’s personal situation, his personal angst. In Psalm 41, David writes at verse 4, As for me, I said, ‘O Lord, be gracious to me; heal me, for I have sinned against you.’ These are the words and expressions I know I look forward to getting to – the personal petitions for healing. I find I gravitate to them most when I turn to God’s word for discernment. For the nugget. For the way out of a particular mess, or the way forward to a decision. It’s a selfish me-focused reading of the psalm. I know I skip over parts of God’s word to get to the part I believe is meant to speak to me. And so it was with the first psalm reading. I sort of skipped over it, anticipating the personal lament and petition was to come soon enough. But the image that came before me in the first verse wouldn’t go away, preventing access to any word I anticipated would be sent to me this morning, to comfort just me. The first line triggered a memory of a face I glanced yesterday in worship. A most sad, life-torn, weathered, too much age on the face of a seemingly young man. A dirty face. Blond bushes of hair bluntly cut at his neck sticking out here and there from a worn baseball cap. The memory of the man trumped all intentions of making the psalm speak to me and my particular circumstance. Here’s how it unfolded, beginning with yesterday’s worship. I went to 8 o clock. As I approached the parish steps, I heard first, then noticed a homeless man (grocery cart stuffed with blankets and clothing at his side) conversing loudly with the sole greeter. 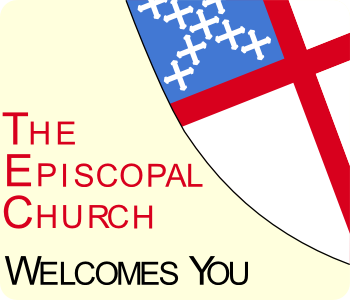 No one else was around – no clergy, no other people approaching for worship. A very quiet Sunday morning moment in the neighborhood but for the very loud, not angry or yelling, just inappropriately loud voice of the young homeless man. I could not hear the greeter. I didn’t know what they were saying to one another. I was grateful to see a way inside that took me around the two, thinking I wasn’t noticed by either. As I entered, the greeter came in behind me to hand me a bulletin and take his post at the entrance doors. The homeless man was wandering away. As I was paused in the narthex with the greeter, I heard the young man yell back to him, “the 8 o clockers are so much nicer.” Hmm, I thought. He’s a regular – on the steps of the church Sunday morning in anticipation of folks walking by maybe with a dollar or more to spare. The weekday street crowds nowhere to be seen on the sidewalk this morning – just the 8 o’clockers at this little urban church – the few that there are. The service began. About five minutes in an audible sobbing traveled from the outside, in – from the open doors at the back of the church, all the way through the center aisle and to the altar. The presider lifted his head and looked straight back. Not everyone turned around. I did. The homeless man had returned and was sitting on the steps with the greeter. The doors were still open. Worship continued with no interruption. We all sang and prayed through the sobbing. Then, it stopped. A few minutes later the homeless man walked confidently down the center aisle sniffing, looking for a front row pew. He slid his hands over the tops of each pew, testing it for what I don’t know. He selected the third pew on the left in the front. No one in front of him. He sat down. Took off his hat. Lifted his head to the front. The service proceeded. No interruptions. No acknowledgments. I began to think about what I would do if I were presiding. Clearly the priest had heard him, noted his entrance. So far, there was no need to do anything differently. But I wondered, what if things got out of hand? What if he began to sob again? I anticipated the outburst. Thought about all the mentally ill living on the streets and where they can go, and where they aren’t welcome. Of all places a Sunday morning worship community should be accessible. But it’s tricky. Sometimes the mental illness of a worshiper makes the rational, heart-felt welcome hard on others and interferes with the worship so that no one is praising God, but instead distracted by the activity of just one. Or worse, indifferent. This is where my mind was wandering and I had concluded that if I had been at the altar and things began to get out of hand, I would just name the elephant in the room. I’d stop the service, leave the altar and come down to wonder with the good folks who showed up that morning, what we thought we should do? Was there a way of praying the Eucharist differently that particular morning so that we could welcome the young man to the table with love, authentically- not be indifferent and at the same time reverential? Anyway, the mind wandered, and then I noticed he was on the ground at the kneeler. Suddenly he stood up and crossed the aisle to ask a parishioner something. He then went to the restroom. Crying could be heard from the restroom. Then it stopped. Maybe he left. A minute later he walked again down the aisle this time with a tissue in his hand. He sat down. Listened to the sermon. There was devil language in the gospel. I wondered if the preacher would speak about the gospel. I wondered what he would hear. She didn’t. He didn’t appear to hear much of anything. He got up part way through the sermon and went to the restroom again. No crying. The worship ended. 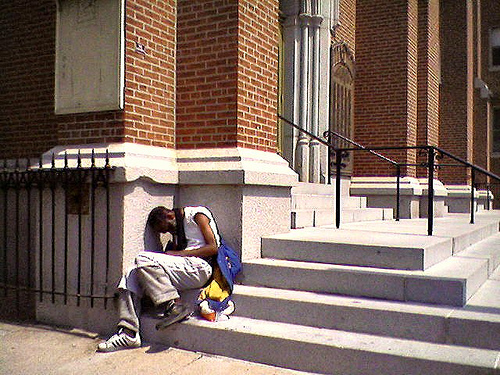 As I exited the building first, I noticed a different homeless person asleep on the church steps. I was able to walk by without disturbing him. I got in my car across the street and glanced back at the church steps. The sleeping homeless man had stood up. He was facing the exiting parishioners. He had some sort of sign in his hand. A box at his feet for donations. The 8 o’clockers were now streaming out. I didn’t notice if anyone stopped. I drove away, thinking about where I would get my cup of coffee and where I could write down my notes about the gospel that the preacher didn’t preach. Oh my God, really? Yes. That is really what happened and how I responded. It was all in my head. I thought about the dilemmas, the sadness, the poverty. I thought about what I would do if…and yet, I did nothing. Nothing but think about it. And then in it hits me and I realize this psalm is not speaking of the poor – people like the crying homeless man who didn’t stay for the Eucharist, or the man on the front steps who hadn’t come into worship at all but only to the steps just before it was over to catch those leaving. No, this psalm wasn’t speaking to them or about them but to and about ‘those who consider the poor‘…and there was only one person who fit the bill on that Sunday morning…the greeter. This was about the that saint – the one sole greeter who talked with, sat with, guided, invited and welcomed him to join the other saints in worship – this grieving young man on the street. And it was the greeter who opened the doors at the end of the service who then must have encountered the sleeping man on the steps. He must not have awakened him or asked him to move so the 8 clockers could exit easily. Churches talk a lot about being a welcoming place, especially on Sunday mornings when the entire purpose is corporate prayer and praise for the Lord, God. It happens – really happens – not because the doors are open and words of welcome are posted, but because of saints like the greeter – happy saints who consider the poor. Praise the happy heart. Praise Him. I wondered about the appropriateness of inserting an image here in order to give the reader some idea of what I saw. During the internet search I came across a photographer who had, with their permissions, taken head shots of different individuals who had found themselves homeless for one reason or another. The professional photographer is Tom Stone and here is his website http://tomstoneartist.com/#/outsiders–poverty/Outsiders_Poverty-24. I am using one of his photographs here because of the similarity, profound similarity, to the young man I saw yesterday and will speak of in this post. Though it wasn’t him, the features, eyes, youth, coloring and even the hat were what I saw on the sad face yesterday. I insert it here just to give you some idea, not to exploit. This entry was posted in Whispers and tagged church, Gospel, praise, Psalm, WORD, worship. Bookmark the permalink.